It has been two years and three months since I said goodbye to my staff, closed the door of my office and left work for the last time. So what has it been like? It took me about a year to get used to being retired, to not feel guilty for walking away from a job I could keep doing perfectly well, not to mention the money. But now as I said in my very first blog post, "The Long Goodbye," I appreciate not having a landlord or a boss and the opportunity to do as I please. 6am Hubby gets up (he's not retired). Wait a minute! Stop the presses! Hubby just told me I have written this same sort of blog post before. Have I learned nothing since that first blog post where I extolled the virtues of retirement because I could sleep in and watch TV with my wine-guzzling poodle? Looking back on what I was writing about when I first started this blog, over two years ago, I see that there was much trepidation and confusion about what my life would look like in retirement. In "The Long Goodbye, Pt. 2," written four days before I left work for good, I worried about turning into a "little old lady," wearing pants with elastic waistbands and eschewing make-up for good. I worried about not having that paycheck anymore and missing out on travel, eating out and expensive theatre tickets. I worried about the end of my shopping career, but most of all, I worried about purpose and meaning in my life, something that my 40 year career as a librarian availed me. Well, I am happy to report none of those fears came true. I still wear make-up (well, not every day but when I go out), and I don't think I look like a little old lady. As for travel, since I retired, Hubby and I have been to Italy, we have visited the grandsons in California several times and I just went on a six day vacation to Santa Fe and Taos with my daughter. 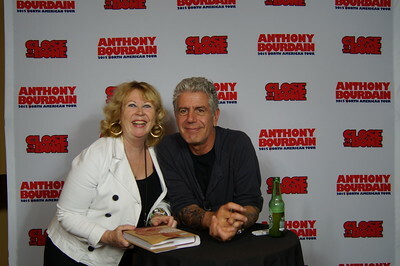 Eating out and theatre tickets - I am still working my way through Seattle restaurants A-Z and, since I retired, we have seen everyone from Lionel Richie to Cher to Robert Plant ("My Summer in Concerts") and had Meet and Greet tickets to see Tony Boudain (and those weren't cheap!). 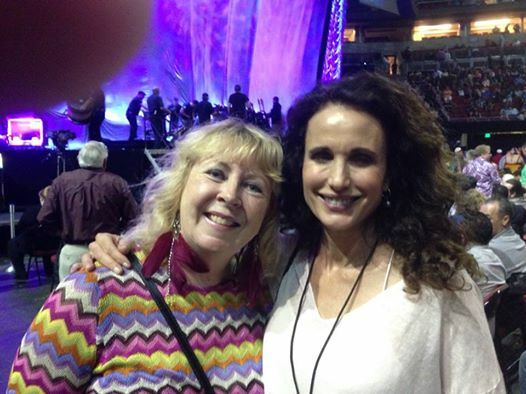 And I just happened to run into Andie MacDowell at the Cher concert. How do you like my earrings? Are those the earrings of an old retired lady? Shopping? I still sneak the occasional bag from Nordstrom past Hubby, and I have a personal relationship with the UPS guy. I became a Senior Peer Counselor. This is a volunteer position through our local Senior Services. I took an eight-session training course and then was assigned a "client." The clients are seniors who are going through some kind of change or bereavement or event where they need support and someone to talk to. I just completed six months with an 82-year-old woman who had been moved from her home to an assisted-care facility. I met with her every week for six months and it was an extremely satisfying and meaningful experience for me. I like to think I helped her - she said she told me things she had never told anyone - but she also helped me. By helping her, she helped me to realize that my life still has purpose and meaning, even if I am not bringing home a paycheck anymore. And I actually thought about becoming a therapist at one time. 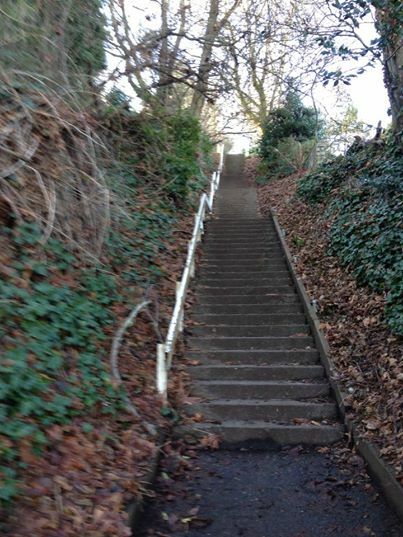 Since I retired, Hubby and I have also done all 25 stair walks in Seattle, I have discovered meditation and tarot card reading, am on my local library board and a council that works to advocate for seniors and my Fitbit and I try to get at least 10,000 steps in a day. I have also discovered the joys of 4pm Happy Hour with Hubby. But I didn't know all of that would happen back when I first retired. On the first day of my retirement ("Retirement- Day 1") I related a typical day and lamented that it didn't look like I was going to change the world. 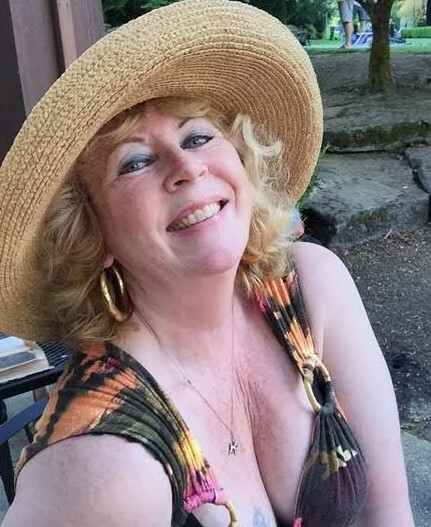 "A mostly humorous blog of reviews and pop culture observations from a retired Baby Boomer and movie loving librarian who reviews not just films and books, but fashion, food and fun while navigating her new life of leisure." Looking at those older blog posts, I also see that I was trying to be all things to all people on every post. 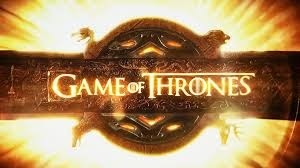 I was reviewing 4-5 movies, 2-3 books, restaurants, plays, fashion trends all in one post. They make me tired just re-reading them! I now realize I was still trying to figure things out. I was not only feeling my way through the whole blogger thing but through the whole retirement thing. What I have discovered since is that I don't have to be all things to all people and I don't have to change the world. I discovered that retirement afforded me the opportunity to change ME, and to reinvent myself. But I have also written about the Beatles ("Why the Beatles Matter"), Oprah ("Why Oprah Still Matters"), meditation ("A Little Meditation on Meditation..."), travel (Rosy the Reviewer Does Italy...") television ("Confessions of a TV Addict"), literature ("A Christmas Carol"), fashion ("A Baby Boomer's Fashion Show" and "Librarian Fashion"), food ("Cooking in an Empty Nest") and a wealth of other topics that interest me, many of them involving dogs in costumes ("My Life Story by Mildred Pierce"). 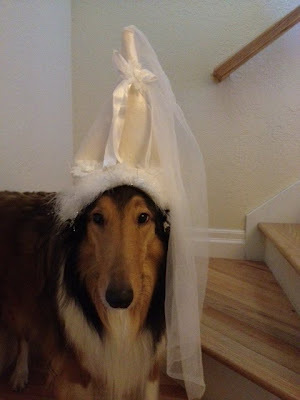 I am not above exploiting my dogs for cheap laughs. After over 2 years and 245 blog posts, I guess I can call myself a writer and a blogger. Some of my blog posts have even been very popular in France and the Ukraine! I have discovered that I like to communicate and in so doing, I hope I am imparting some information and insights, giving you something to think about and, at the very least from time to time, amusing you. I always wanted to be an actress and actually studied to be one. But I also wanted to write, and after discovering Siskel and Ebert back in the 80's, I thought what better way for someone with a penchant for acting and movies to express herself than as a movie critic? I thought, what a great job. But I never hoped that I might aspire to that. (The International Movie Database - look up a movie you are interested in and find me under "External Reviews" for that film). And working as a Senior Peer Counselor, I am fulfilling an interest in counseling. So as I look back on the last two plus years since I retired, many of those fears I had were never realized and, I am no longer defined by what I did for a living: a librarian. And I am no longer feeling guilty, confused and worried. Oh, I will always be a librarian and probably a worrier, too, but now I have discovered that I am a blogger, a movie critic, a pop culture reporter, a meditator, a counselor, a foodie, a tarot card reader and a stair climber in addition to what I always was: a mother, a grandmother, a wife, a librarian, a fashionista, a dog lover and a TV addict. And that's enough. There is joy in that. Without someone telling you what to do and without obligations that are not of your making, retirement becomes a time of reflection, adventure and reinvention. Now is the time to do what you have always wanted to do or to find out what that is. Become the YOU, you have always wanted to be. Find your joy, even if it's sleeping late and watching TV with your wine-guzzling poodle. So this is for all of you out there who might be newly retired or just contemplating it. If you are newly retired, give yourself a break and don't worry too much. It might take awhile, but the joy will come. If you are contemplating retirement and you are scared, be brave. The joy will come. Retirement is not for the retiring. Be brave. Retirement is a chance for reinvention, discovery, freedom and joy, and, for me, I can't wait to see what the future brings. Maybe when next you see me I will be giving tarot card readings as Madame Rosy! You and Susan are making me wish I started a blog when I retired....except I don't think blogging existed in 1997. If I wrote about my retirement I would have thought more about what I was doing or not doing. I have just ambled along not giving it proper consideration. You two are really making me think! Sazzy, you SHOULD write a blog. Why not? It's easy and free. When the Internet first happened I remembered thinking, gee, I should start a website so I can promote my own philosophy. I am not sure at the time I had my own philosophy but it seemed like a good idea at the time. Twenty years later, I DO have my own philosophy and my own website of sorts. Go for it. I can tell you have a LOT to say!